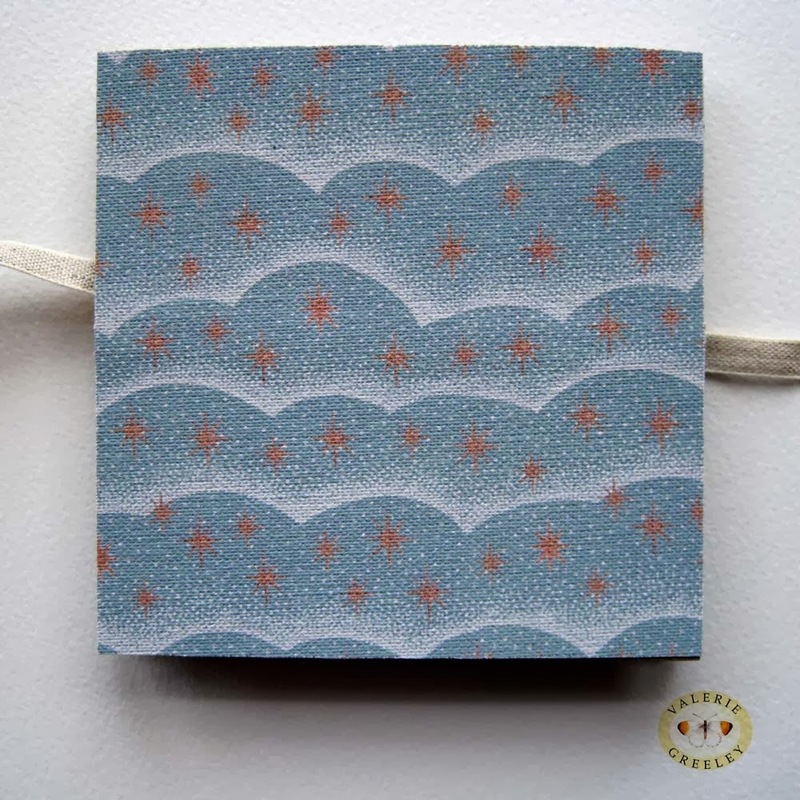 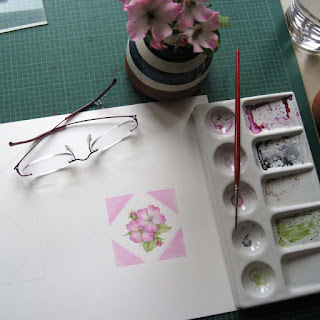 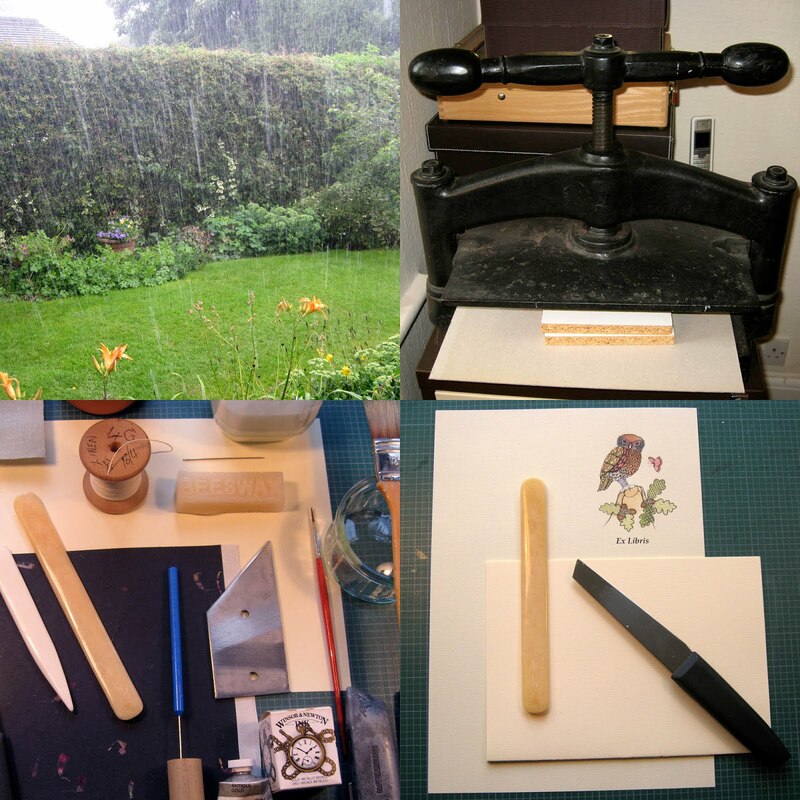 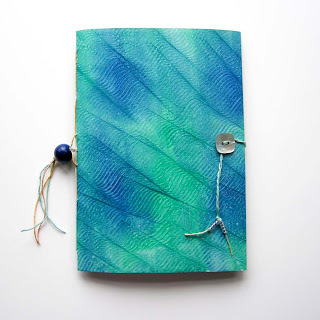 Here you will find some of my adventures into the world of the artist book and hand made books. 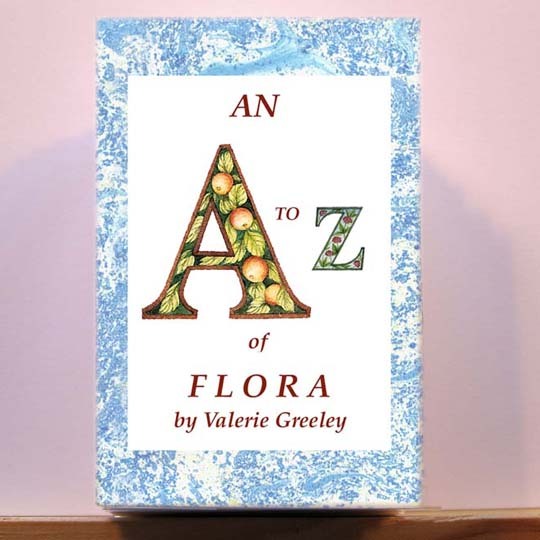 All illustrations, artwork and decorations have been created by me and are © Valerie Greeley. 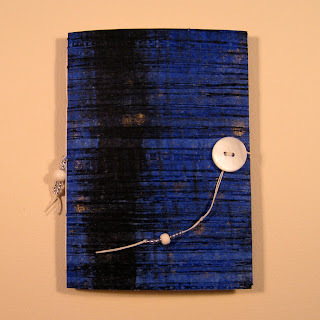 A decorative journal covered in cloth with painted decorations. 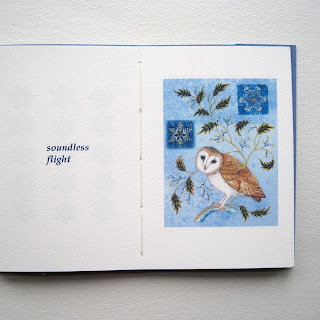 "Silent Flight" Artist Book,(see below) each book bound with a different cover.Featuring hand made paste papers, linen thread, buttons and beads. One has a lino printed feather decoration. 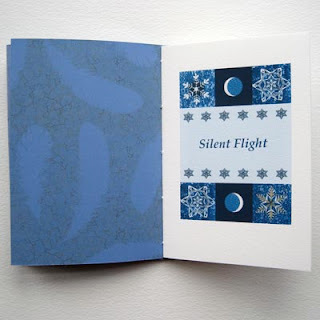 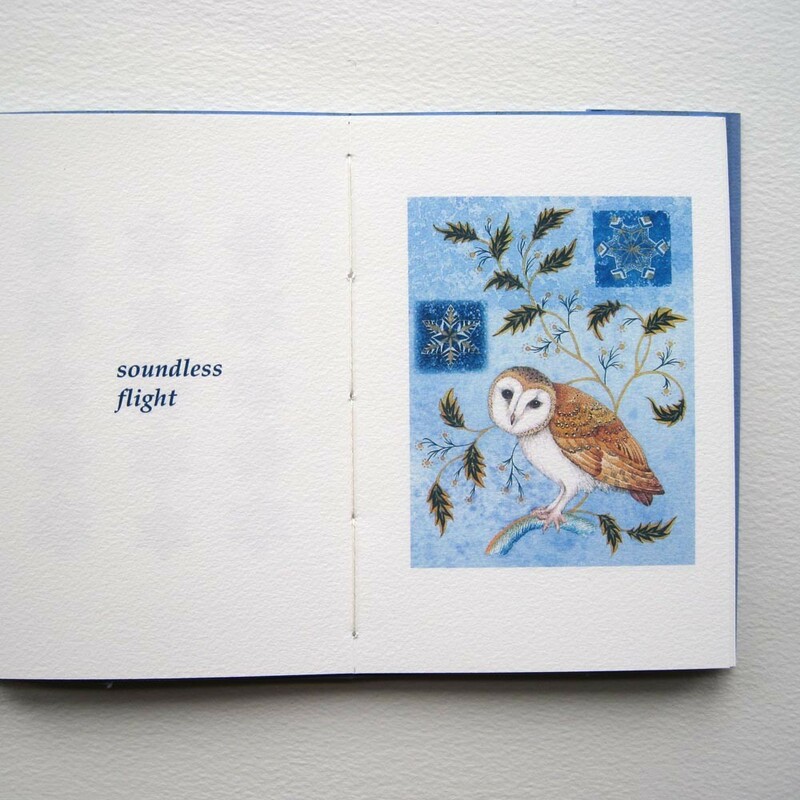 The illustrations are linked together by a simple verse about a clear, still, moonlit winter evening, inspired by the silent flights of barn owls, snowflakes and the moon. These single section books have been handbound using a longstitch binding with waxed linen thread. 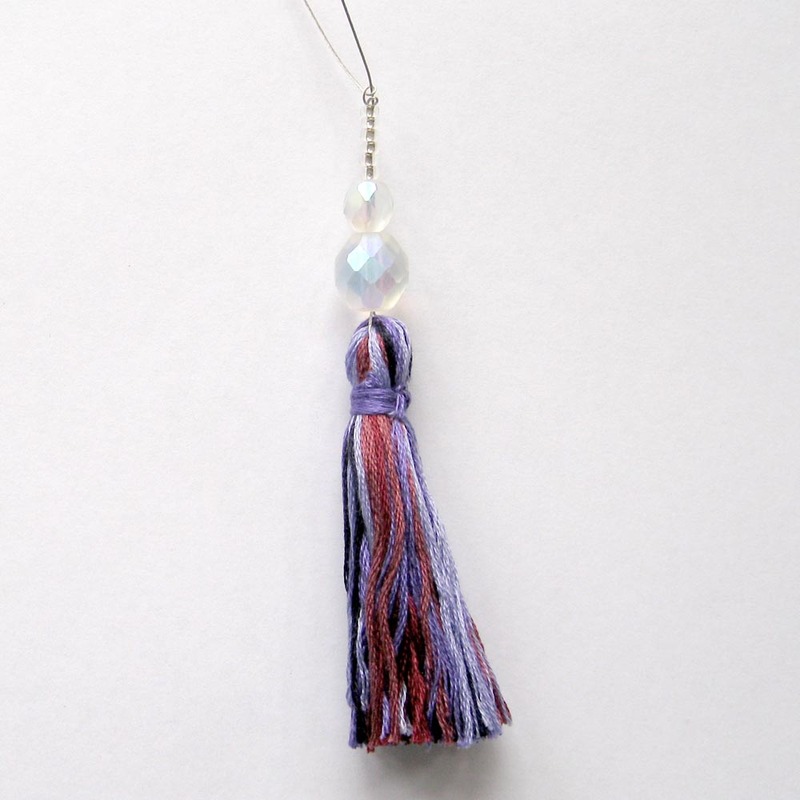 There are decorative closures using buttons/ beads, hand sewn onto a waxed cotton thread. 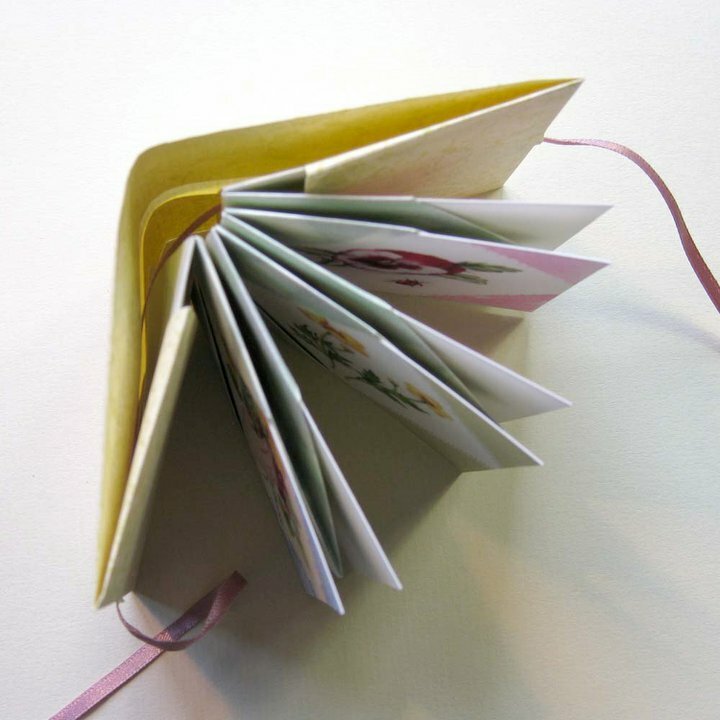 The book measures six inches by four inches. 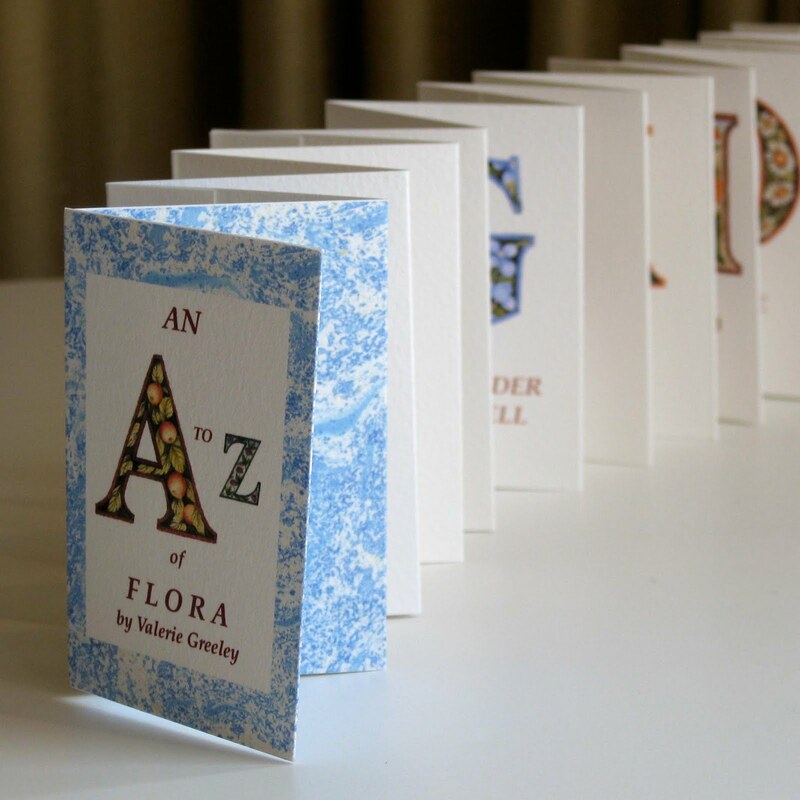 "An A to Z of Flora"
This miniature alphabet book measures just three inches high by two inches wide. Each letter has been decorated to illustrate a plant or flower, for example R is for Rose, V is for violet etc. I originally created these illustrations for an address book, which was first published by Blackie and Son Ltd. Each book is signed and numbered; the edition size is 50 copies. 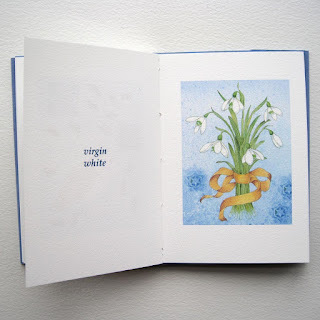 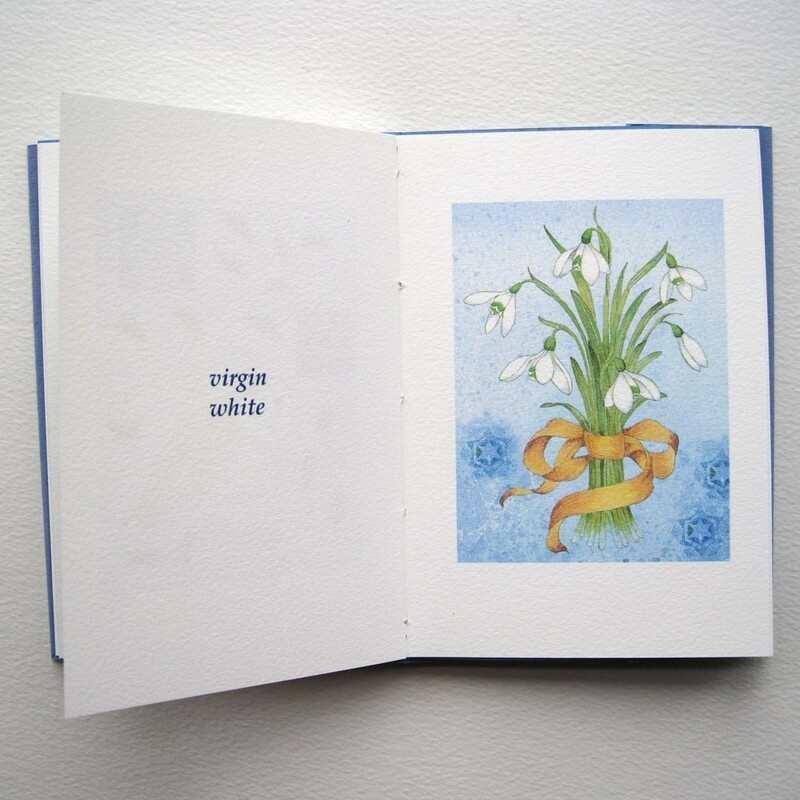 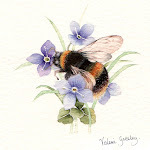 The original artwork was painted in watercolour onto Bockingford paper, I have since had each letter scanned and put onto a digital file, enabling me to print very good reproductions using my computer and printer. 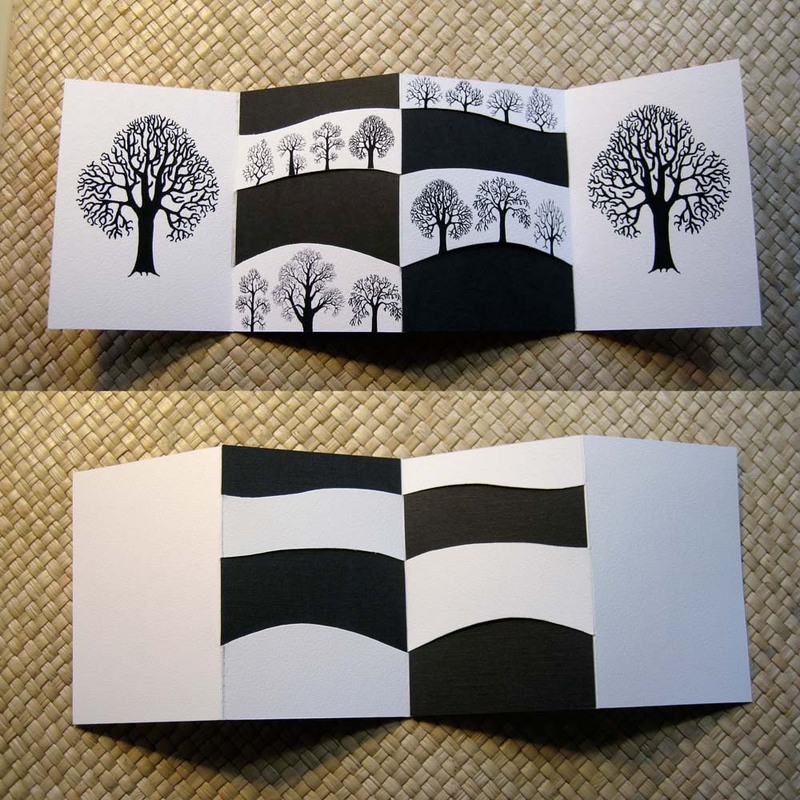 After trying out many different types of paper I was delighted to find a similar Bockingford paper suitable for ink jet printing so I have used this in the creation of this concertina book. The great thing about this structure, apart from its simplicity, is that you can display the book horizontally, allowing many different images to be viewed at the same time. 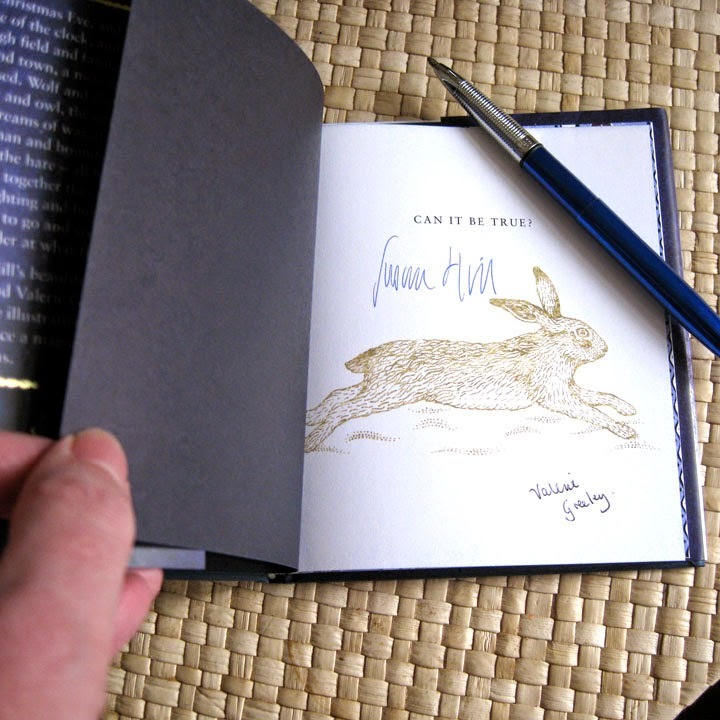 This is a signed, numbered, first edition of 50 books, which I have illustrated and printed digitally. 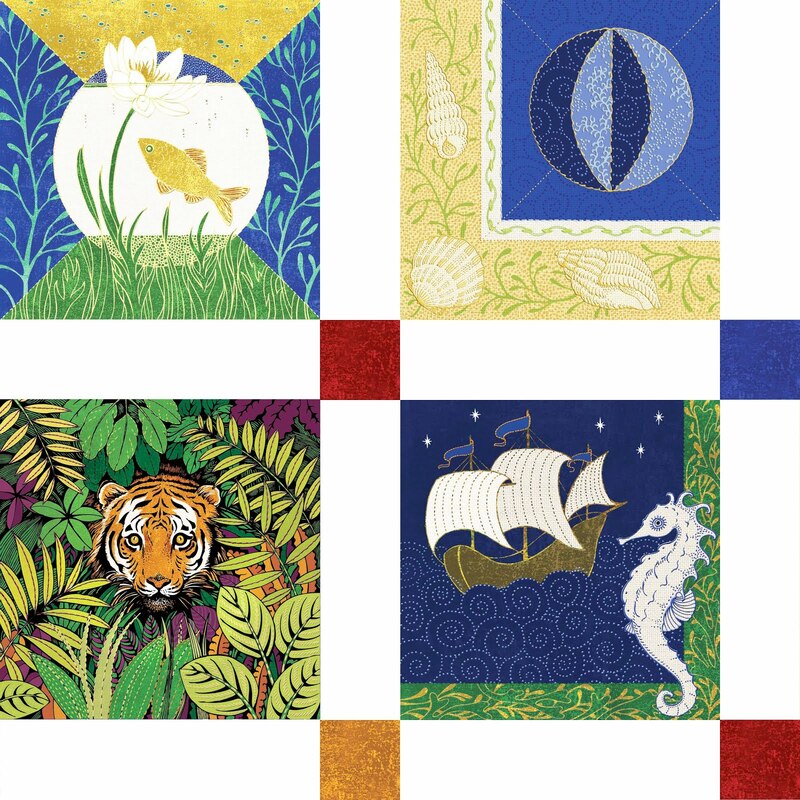 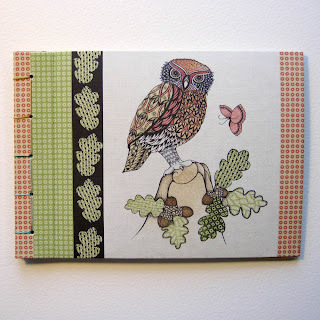 The illustrations are from my collection of textile designs with the same name. 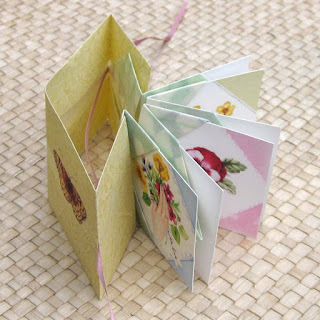 It is a miniature concertina book which measures three inches square. 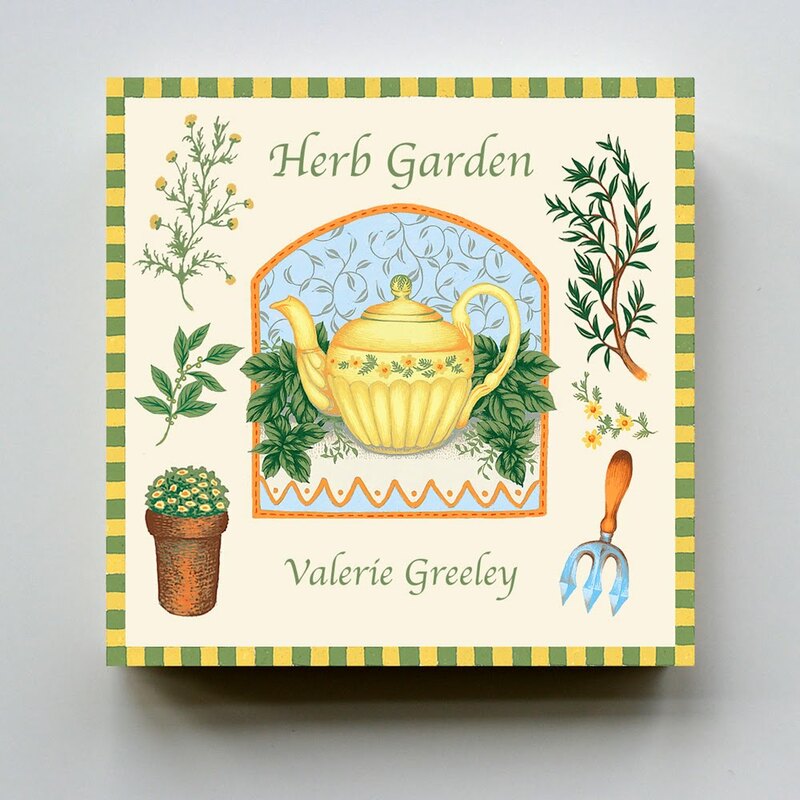 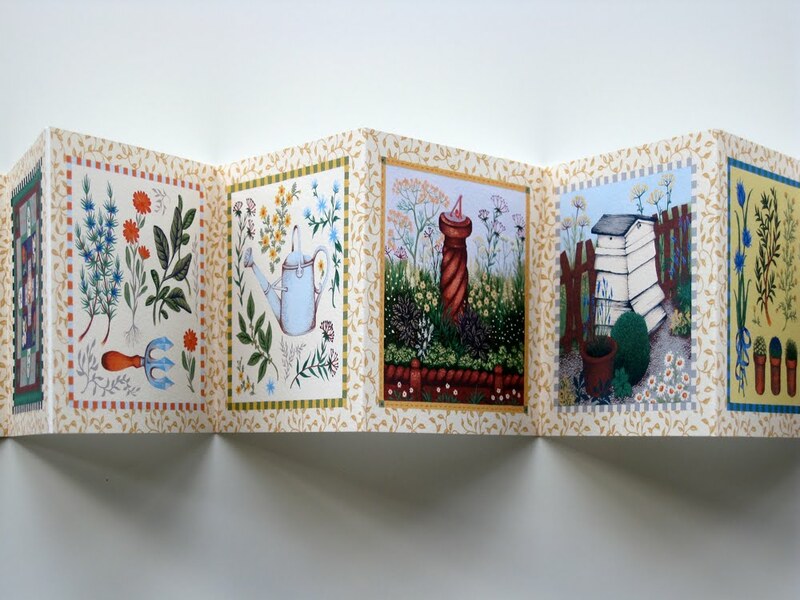 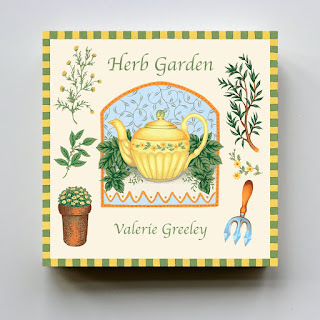 There are a total of nine full colour illustrations depicting herb tea, herb wreaths, sundial, bee hive, knot garden, together with tools, herbs and garden implements. Following on from "Herb Garden", this book also started as a collection of textile designs. 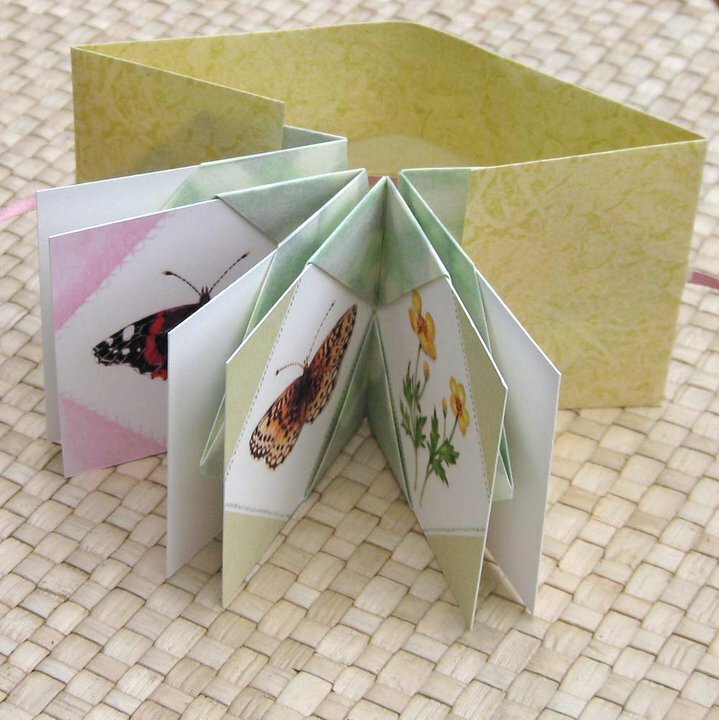 A miniature concertina book which measures three inches square. 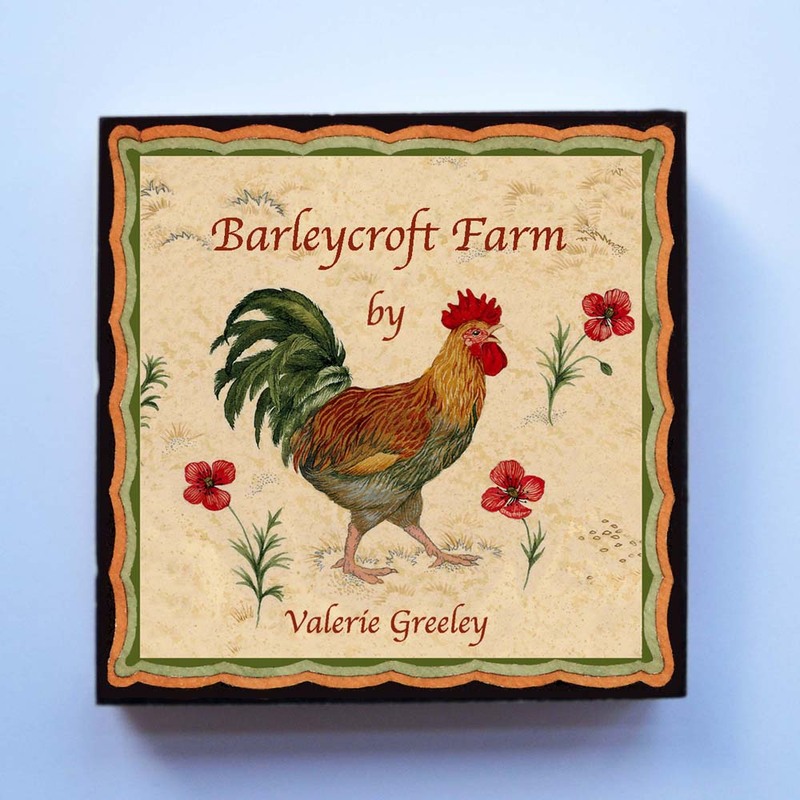 There are a total of nine full colour illustrations depicting the flowers and animals found on an English country farm. 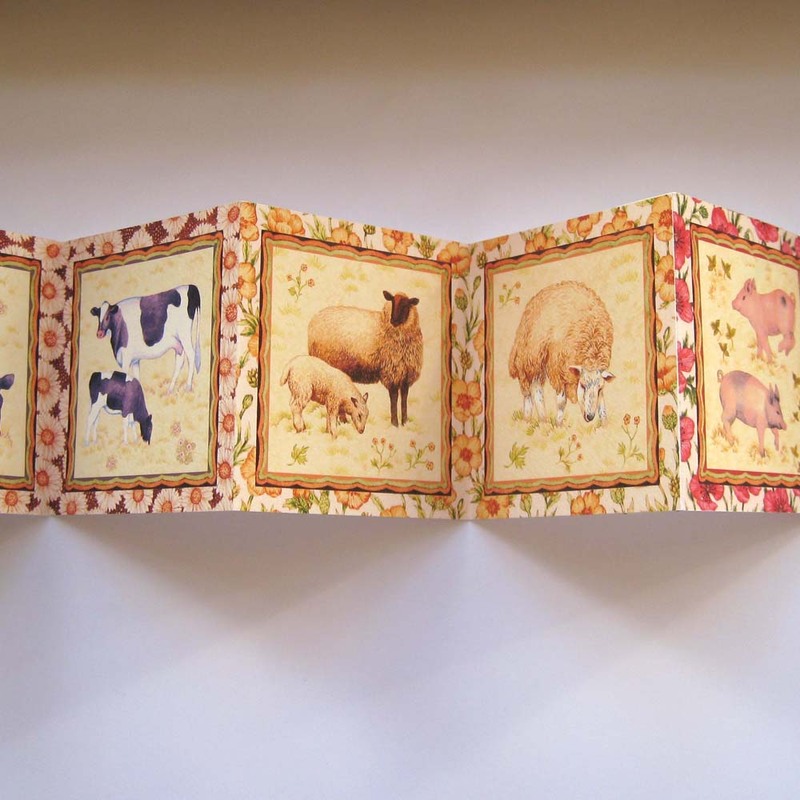 There are cows, pigs, sheep, a cockerel, chicken and a horse contained within decorative borders of poppies, buttercups and daisies. 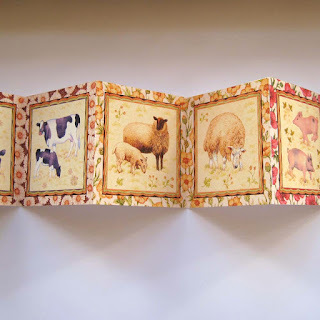 This book is very difficult to explain but if you look at the photographs you will see that the book appears to be like a very simple concertina book. When it is opened it has inside covers decorated with trees. The first and last spreads have trees and the middle has snowflakes and a fox. 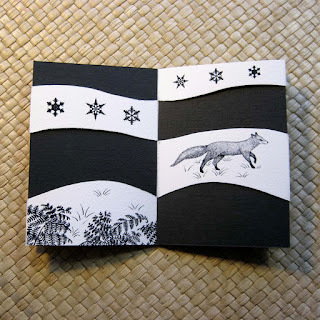 When you hold the cover pages and pull, the book becomes flat and the fox disappears. 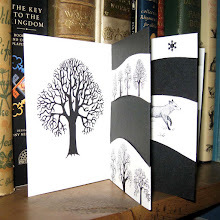 When you turn the book over there is no sign of the trees or the fox. 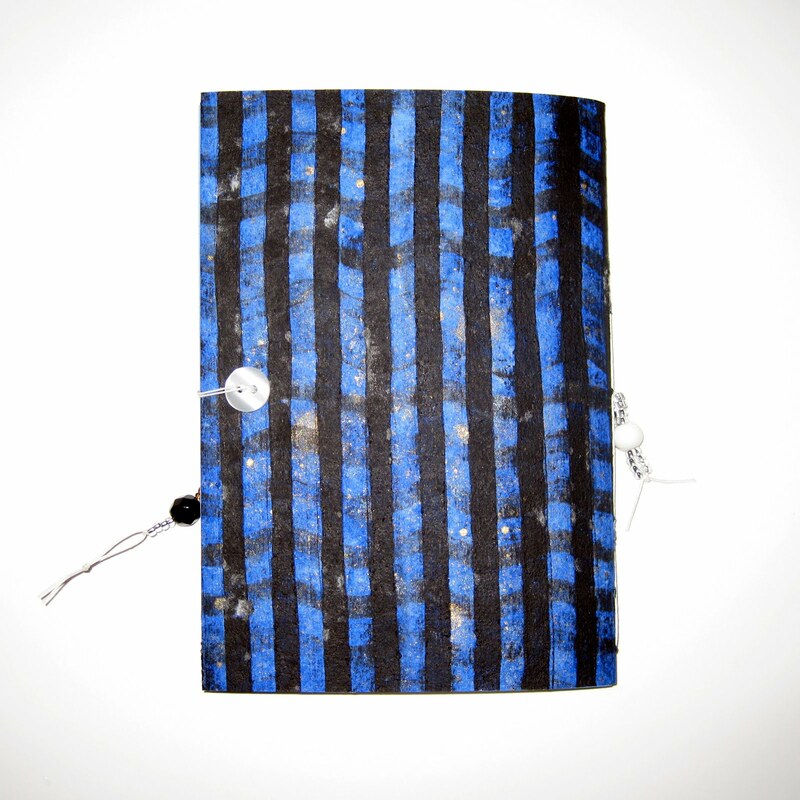 Now if that isn’t magic I’ll eat my hat. This structure is sometimes called a woven flexagon. 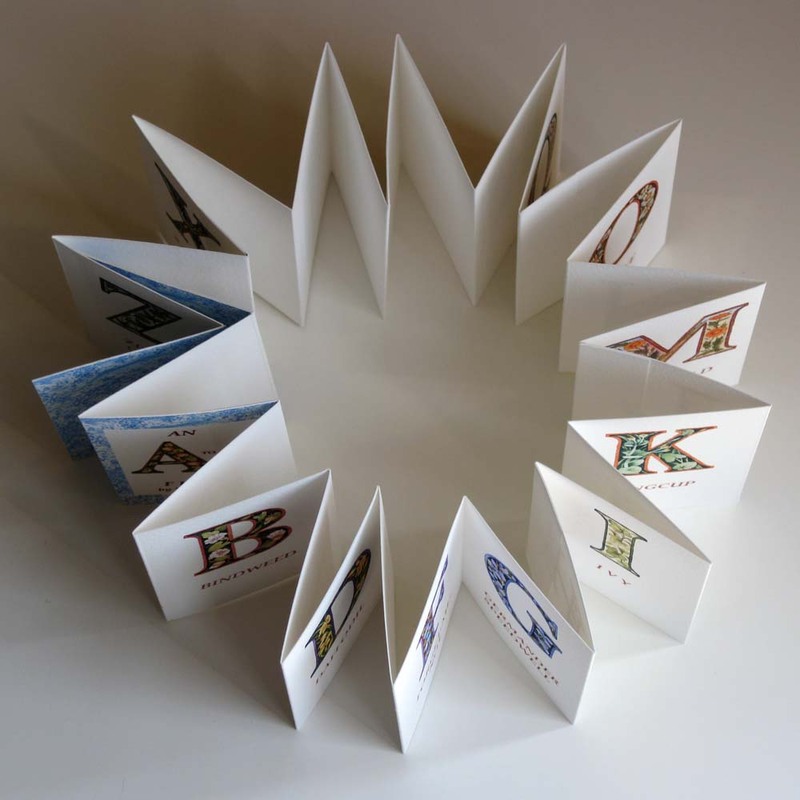 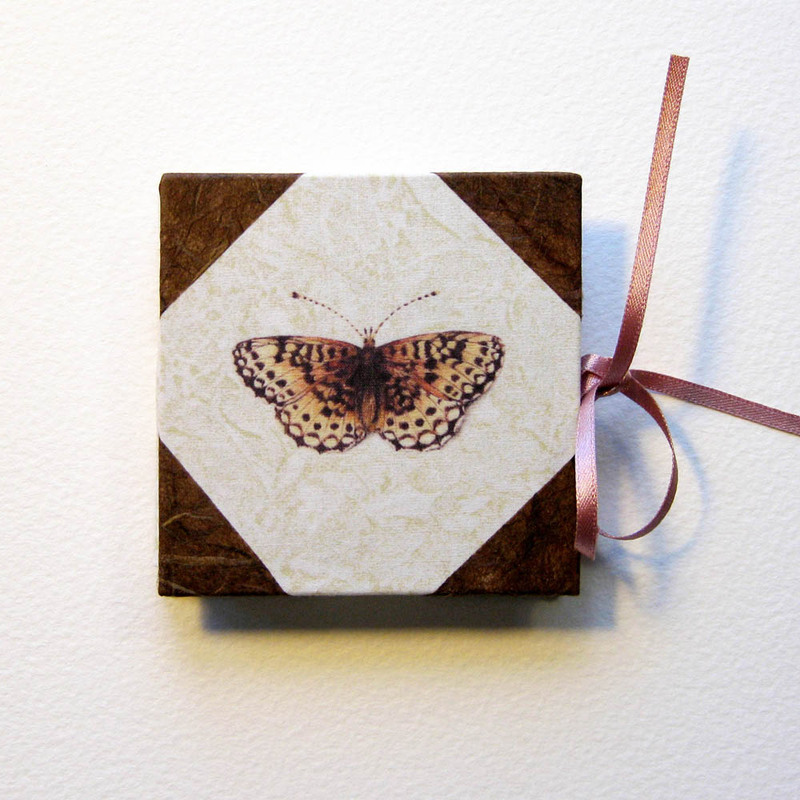 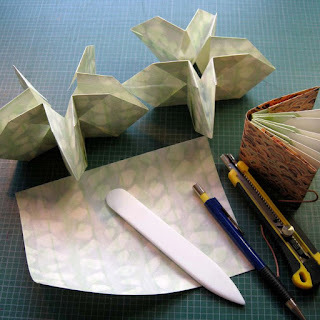 This simple structure uses folded paper to hold and exhibit small, square pieces of artwork. 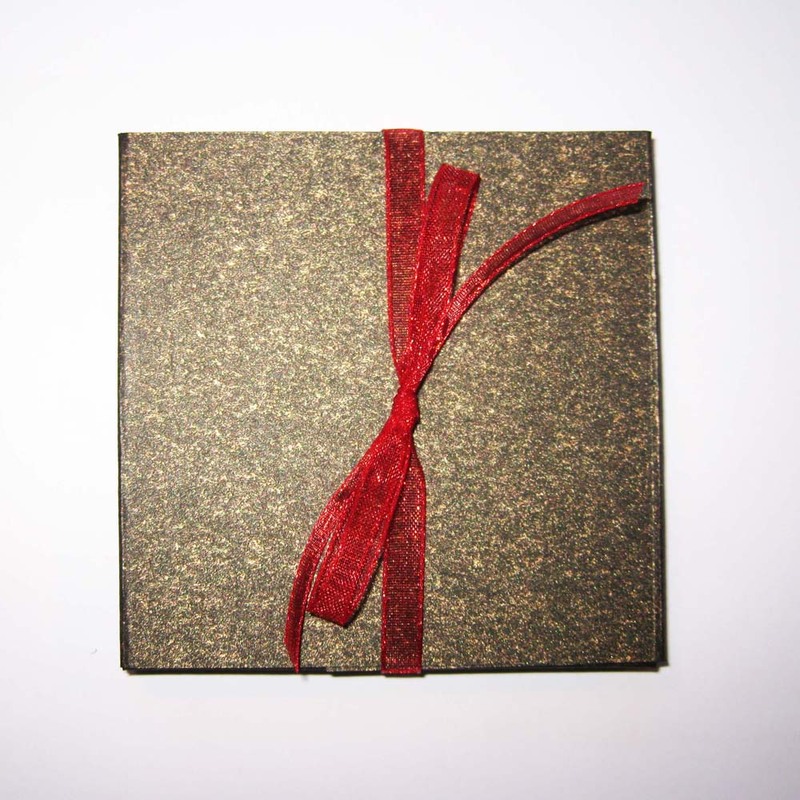 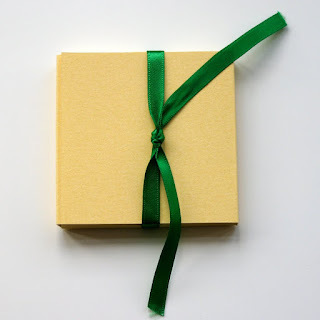 The waxed cover wraps around the book and is tied with ribbon. 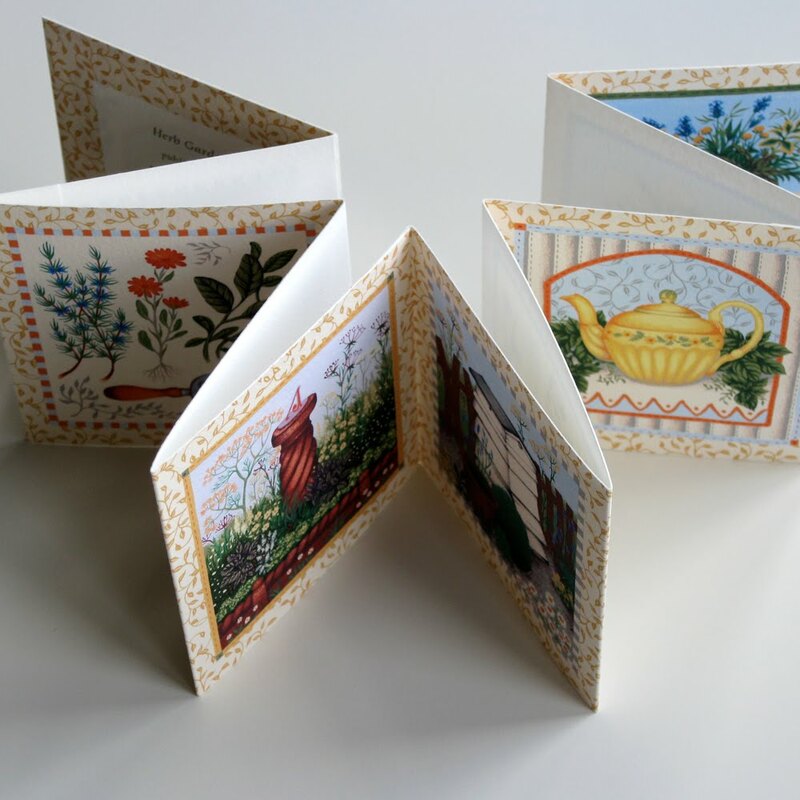 The idea behind this book was inspired by Victorian keepsakes, often incorporating various collections such as flowers, butterflies etc. 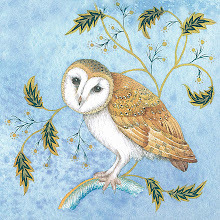 The artwork was first painted in watercolour and then printed digitally. 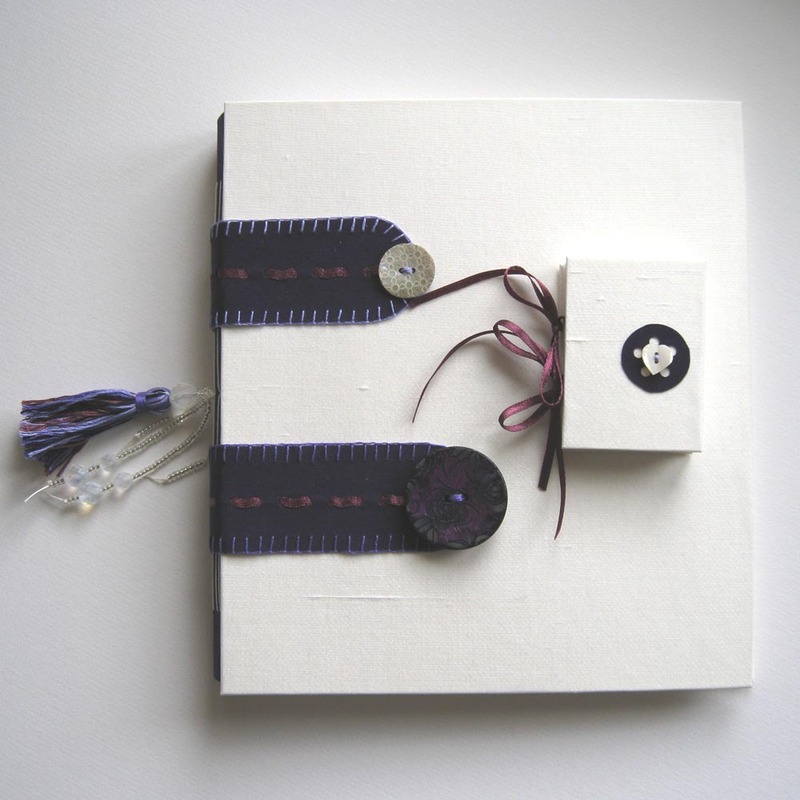 I made this special wedding guest book for my Goddaughter who requested ivory and purple. 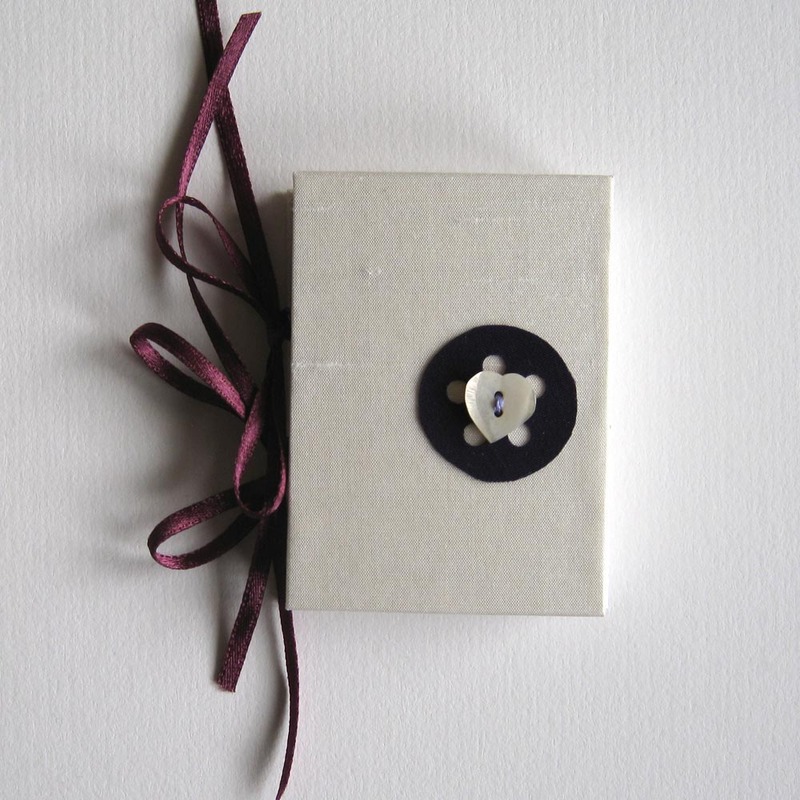 She wore ivory silk and the bridesmaids wore purple. The bride made her own bouquet using fabrics and vintage buttons so I decided to carry on the theme by using the same materials. 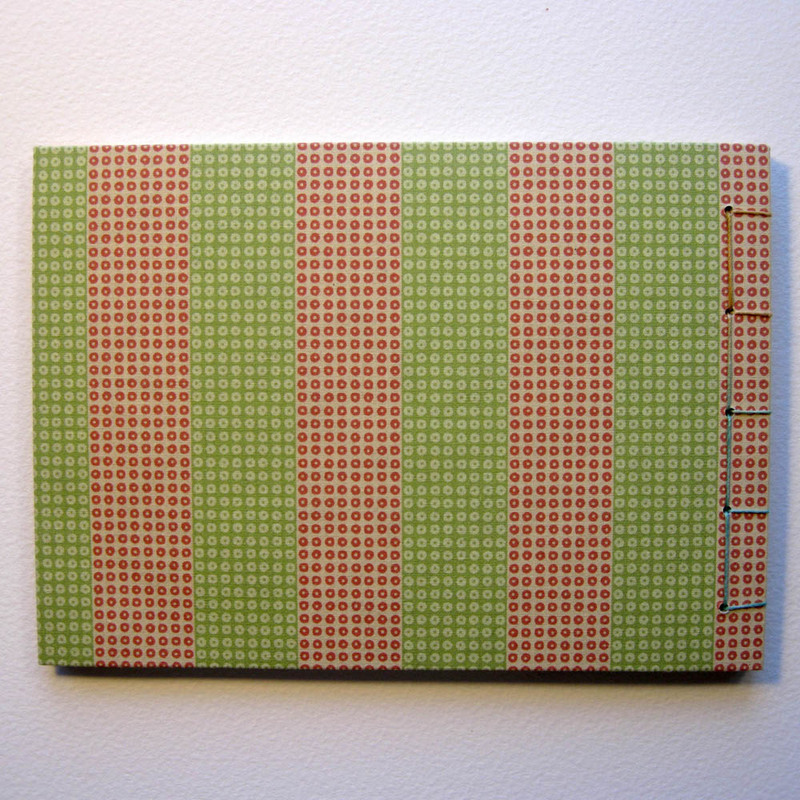 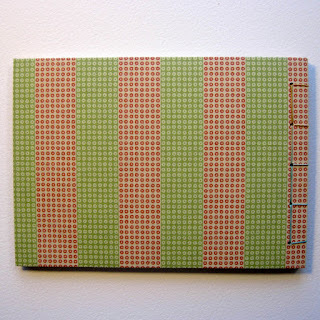 This is a multi-sectioned book, bound in longstitch. 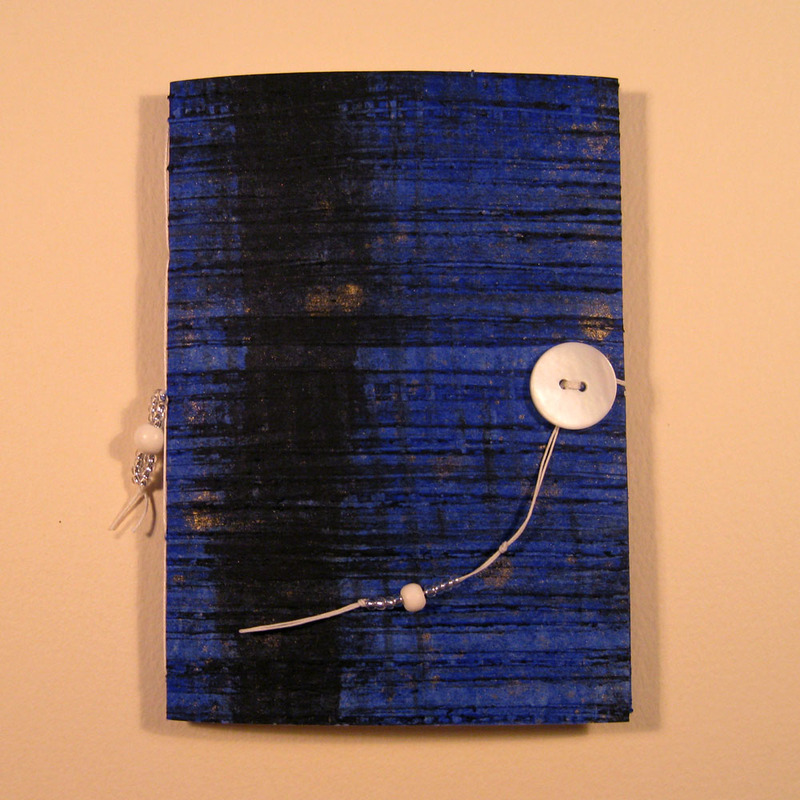 I used a waxed linen thread and attached the sections to a fabric strip which had been lined with paper. 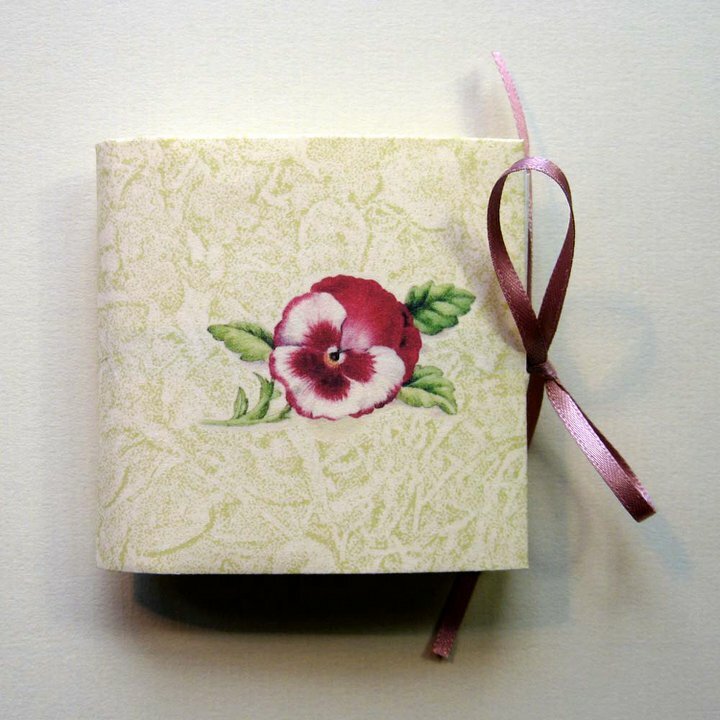 I then covered the boards using ivory silk lined with Japanese tissue paper. 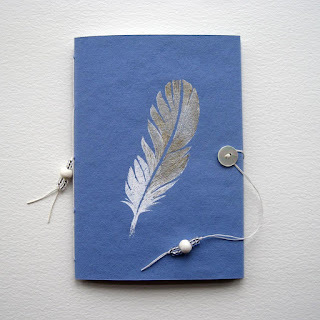 I used a hand made paper which had pressed flowers for the end papers and I made a decorative tassel with embroidery threads and crystal beads. 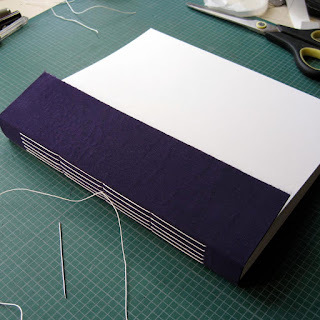 The two strips of purple fabric lined with paper wrap around the book helping to stabilise the structure whilst adding a decorative feature. I used a blanket stitch to decorate the edges and added buttons. 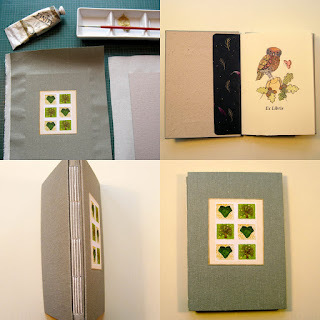 With some of the left over fabric I made a second miniature book using a concertina structure held at the spine with ribbon. "The Owl in the Oak"
I designed this decorative cover and printed it onto cotton. 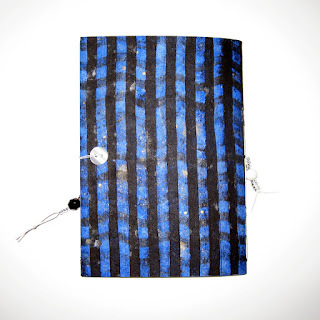 The fabric was specially treated to take ink jet prints. 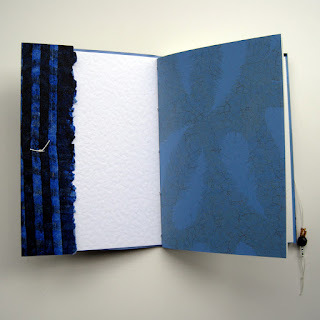 I used a Japanese style stab binding for the structure using hand dyed thread. 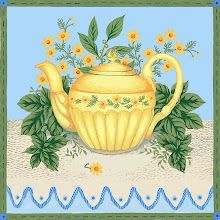 The design was influenced by Elizabethan embroidery and Japanese textiles. 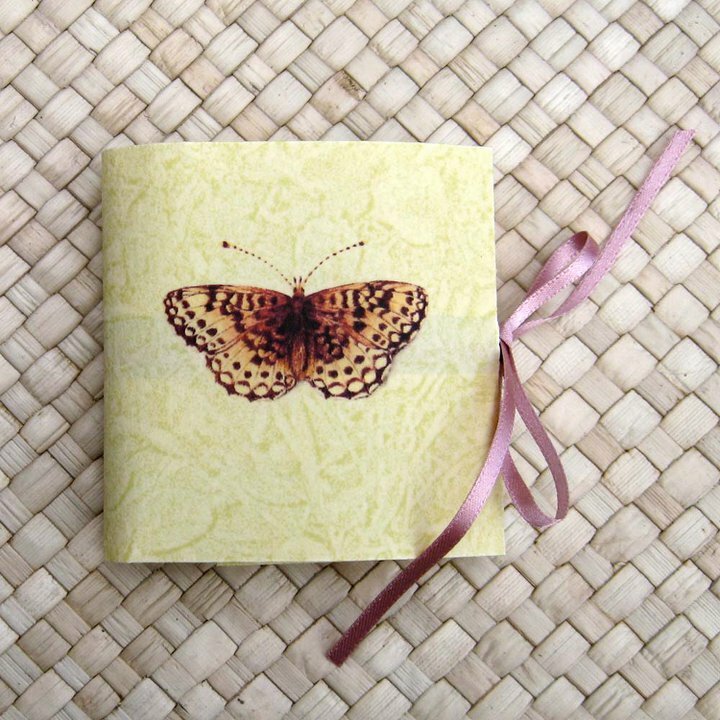 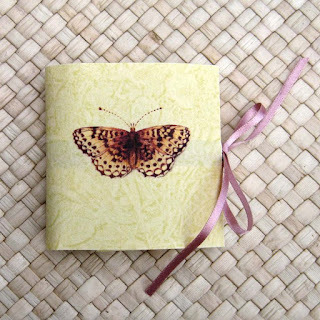 The cover is printed canvas over card featuring one of my textile designs. 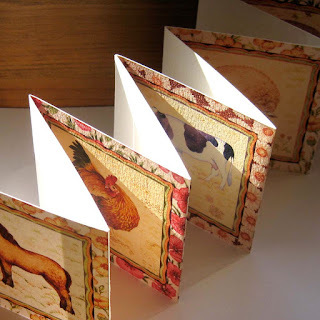 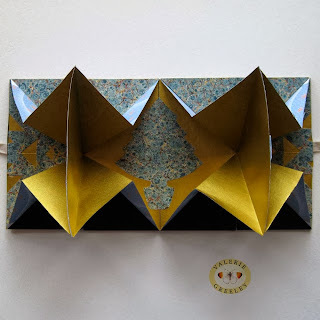 The interior is folded paper using marbled and gold decorative papers.